The DS-9000 Dictation Recorder aligns well with professionals in an environment where high quality recording is necessary and Wi-Fi may be restricted by policy. Featuring a durable, impact-resistant design (up to 1.5m high) and 2.4″ full colour display, both models combine optimum ease-of-use with maximum recording quality. Thanks to PIN protection and 256-bit DSS Pro audio codec encryption, even the most sensitive files remain secure at all times. 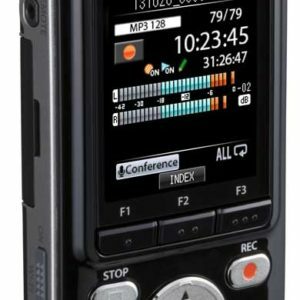 The Olympus DS-9000 digital voice recorder is an accessible, easy-to-use digital voice recorder built upon the feature-rich heritage of Olympus’ industry-leading line of professional dictation devices. It is designed to seamlessly integrate into the digital workflow for maximum efficiency and productivity. Featuring a 2.4″ full color display with 260,000 colors, basic commands are easily operated with the use of a thumb through a precise four position slide switch. For complete digital integration, the included Olympus Dictation Management System (ODMS) software system is designed to increase efficiency in the dictation and transcription workflow. ODMS allows authors to easily download dictation files onto a computer, and share them instantly with transcriptionists through local networks, FTP or Email. Available 256-bit AES file encryption boosts security, and individual files or entire folders can be password-protected. ODMS can easily incorporate a speech recognition process in the workflow. The Olympus DS-9000 digital voice recorder provides exceptional security to business-sensitive recordings. In addition to a PIN-based lock function, the device features 256-bit file encryption with DSS Pro audio codec, enabling automatic file encryption in real-time, during the recording process. Designed specifically for recording human voices, the DSS Pro audio codec ensures the highest quality speech recording while offering the editing features necessary for professional-level recordings. 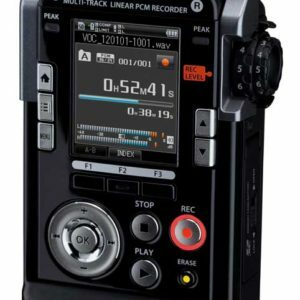 The Olympus DS-9000 digital voice recorder ships with an ODMS R7 DM License, LI-92B Lithium-Ion Battery, KP30 microUSB cable, and Carrying Case. Similar to the DS-9000, the DS-9500, announced this past spring, simplifies work flow and increases dictation management efficiency through advanced features including dictation transfer and device configuration utilizing Wi-Fi technology to enable sharing of dictation from anywhere and allowing the user to send dictation immediately to their transcriptionist without the need for a USB cable, docking station or computer. The DS-9500 is paired with a dedicated docking station, as well as an AC Adapter bundled for recharge with the docking station. The AS-9000 Transcription Kit pairs with Olympus DS Series devices to provide a complete, end-to-end professional dictation system. Featuring a four-button foot control USB pedal, lightweight headset and ODMS-R7 software, the AS-9000 seamlessly integrates into the office work flow to streamline data sharing and distribution of dictation between professionals, departments and multiple office locations. A newly designed user interface provides easy setup, navigation and work-flow communication to help effectively manage office deadlines. Included 256-bit AES encryption with DSS Pro format provides trusted security to your most sensitive information. The AS-9000 is able to play back your encrypted files from Olympus professional dictation devices, which cannot be done on third-party transcription programs.